The launch of the $2 million, five-year project “Assessment of the current state of coastal restoration needs across Nunavut” or Coastal Nunavut project, was announced on June 25, 2018 by Honourable Scott Brison, President of the Treasury Board. A partnership between Dalhousie’s Marine Affairs Program and the Government of Nunavut, funded through the Department of Fisheries and Oceans Ocean Protection Plan (Coastal Restoration Fund), the Coastal Nunavut project will assess coastal restoration needs across the territory. 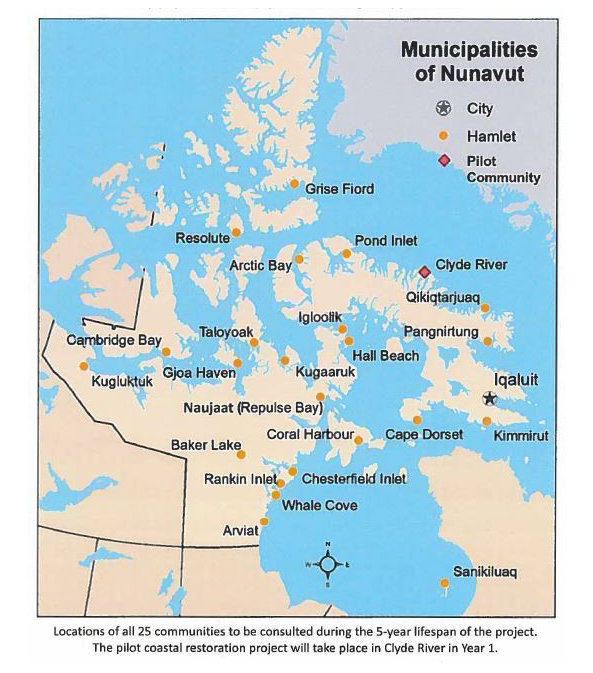 Community consultations will be held in each of Nunavut’s twenty-five communities to determine coastal restoration priorities, feasibility studies of potential projects will be conducted, and at least three restoration interventions will be carried out. The Coastal Nunavut project will also build the capacity of communities to begin systematically restoring key species and key habitats across Nunavut and to pursue coastal restoration and monitoring activities well into the future. The Hamlet and Hunters and Trappers Organization (HTO) of each community will be involved at every stage of this community-driven process. “The importance of getting community insights into how the environment has been changing is critical to the success of this project”, notes Principal Investigator Dr. Lucia Fanning, of Dalhousie’s Marine Affairs Program. The project will also seek support and strategic advice from key Nunavut institutions and the three regional Inuit organizations before, during, and following the project lifespan. Inuit Qaujimajatuqangit (IQ or Inuit traditional knowledge) is central to the Coastal Nunavut project. The knowledge of each community will be documented and applied to the development of coastal restoration plans to ensure that they are based on the best available information. “The long-term health and condition of fisheries and fish habitat rely on strategic coastal restoration plans that value Inuit Qaujimajatuqangit, science and sustainability,” explains Janelle Kennedy, director, fisheries and sealing division, Government of Nunavut. The Coastal Nunavut project builds on previous partnerships between Dalhousie’s Marine Affairs Program and the Fisheries and Sealing Division, Government of Nunavut, including key baseline monitoring and research programs such as the Nunavut Coastal Resource Inventory, Nunavut Community Aquatic Monitoring Program, and the Fisheries and Western and Indigenous Knowledge Systems (Fish-WIKS) SSHRC-funded research project led by Dr. Lucia Fanning. It is intended to inform other projects and programs at federal and territorial levels, such as the Nunavut Planning Commission, the Nunavut Wildlife Management Board (NWMB), Indigenous and Northern Affairs Canada (INAC), and Fisheries and Oceans Canada (DFO). Project results will include coastal restoration plans to be presented as a final report and interactive map, fully translated in the four official languages of Nunavut. Online and hardcopy reports will be made available to communities, agencies, and the general public. With technical support from the Marine Affairs Program visualization lab, project data will be available to combine with other datasets, to further inform coastal planning and fisheries development in the future.